Posted in Barack Obama, Donald Trump, Foreign Policy & National Security, George Bush, Hillary Clinton, Iraq, Ronald Reagan. Tags: Barack Obama, Donald Trump, George Bush, Hillary Clinton, Iraq, Libya, North Korea, Ronald Reagan, Saddam Hussein. RSS feed for comments on this post.. TrackBack URL. Her gross violation of the rules written to provide further transparency, and then repeatedly lying about it, is pertinent. Besides lying about the email, she has a history of lying us into wars. She also has a bizarre history related to nuclear weapons, such as when she attacked Obama, disagreeing with him that we should take nuclear weapons off the table with regards to al Qaeda. We will see if we get by without a nuclear holocaust under Trump. Despite his irrational response yesterday, overall the risk of war was far higher with a war monger like Clinton. I certainly am not going to pretend that I know the best path to solving Korea. But I would like to point out how different the situation is compared to conflicts elsewhere. North and South Korea don't have sectarian issues like Sunni vs. Shia like many middle eastern countries have, or centuries of hostilities between Arabs and Jews. The two countries have a relatively homogenous culture and language. I think it in some ways parallels the East/West Germany split, albeit that was entirely an artificial divide, my understanding is the North/South split of Korea is mostly artificial but there are some actual cultural differences to some degree, perhaps more comparable to the differences in the U.S. between the coastal population and interior. Thus, while it is very possible that things could go very bad, there is hope that things could go the way of Germany, with a relatively peaceful unification. Sadly, I can't think of any historic examples of a truly peaceful transition from an iron-fisted dictator to something better. All that being said, what impact, good, bad , or otherwise, does Trump's fiery words have on N. Korea, their people and their leader(s) ? Very hard to say, but I would proffer a guess that his words have no impact. Kim is going to do what he is going to do, his fear of assassination and/or being attacked militarily is whatever it is. I don't think Trumps words have raised or lowered the level of N. Korea's fears. The difference in East Germany is that they were a Soviet satellite, and the main obstacle to reunification disappeared with the collapse of the Soviet Union. Similar peaceful reunification in Korea is not going to happen as long as the current government of North Korea is in power. It is hard to say if Trump’s idiotic statement will matter long term. Short term we now see North Korea talking about shooting missiles towards Guam, which could lead to further escalation. We needed the US government to work towards reducing hostilities, not increasing them. Of course regardless of whether Trump made this statement, he doesn’t have the vision to try to reset relations with North Korea. Of course you statement is true that East Germany was a satellite state and N. Korea is not. However, I would argue that the comparison is more similar than dissimilar in that N. Korea is so heavily dependent on China that it has the characteristics of a satellite state. 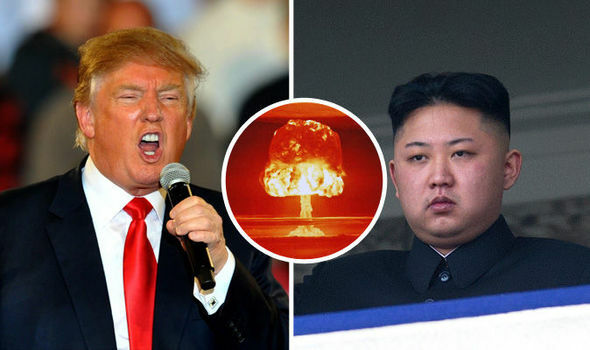 While I believe Kim Jong Un is his own independent minded, ruthless dictator, and would not willingly submit to orders from China, I believe if China pulled the rug from under him, both overtly and/or covertly, they could easily topple him and his government. I will also concede that even if I am right about my assessment of this underlying Chinese power in N. Korea, the collapse of the Soviet Union does not seem to have a parallel in that there is no indication that China will be collapsing anytime soon. So while I agree with your statement that reunification in Korea is not going to happen under the current N.K. government, I would argue that the removal of that government would not be all that difficult if China wanted it to accomplish that. While it would seem that China is happy with the status quo, and a unified Korea would likely be seen by China as a greater threat, the increasing unstable nuclear activity of N.K. might cause China to re-examine their position. If China wanted North Korea to collapse it is possible they could make this come about. However I doubt that China would want this. If they felt compelled to act due to North Korea’s nuclear program, it would probably be to put in a government they have more control over, not to have them unify with South Korea. Good point Ron regarding if China did act, it would most likely be in installing a puppet government rather than allowing unification. I might personally consider a puppet Chinese run government a better alternative to the current N.Korea, as I would consider it more likely stable than Jong Un. It is just so sad in that North and South Korea really should be together IMO, I don't believe the people have any real beef with each other. Only those with positions of power, who don't want to give up that power, that's what is causing all this headache and possibly someday horrific devastation. Yes, in this case a puppet government under Chinese control would probably be better. I’m not sure if South Korea would want China on their border that way, but they also might see it as preferable to the current North Korean government.